So why skunks? They are pretty easy to identify, thanks to Bambi's friend Flower. And they are pretty easy to smell, too. But they have lovely coat patterns that are worth seeing. Asia has its own skunks, called stink badgers. It's now thought that these aren't badgers at all, but skunks...though who knows what they'll be classified as tomorrow? So I have included them on our skunk sheet. Not included is a skunk that was being cared for at Wildlife Waystation in California, where I worked for awhile. That skunk was, believe it or not, white with black stripes! Wish I had a picture of him to include. 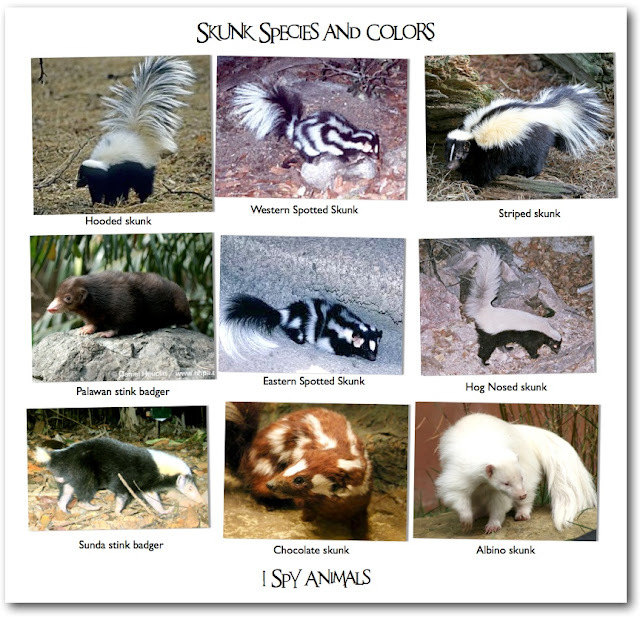 So enjoy the skunks; they are beautiful, too! And yesterday's creature was a leucistic raccoon...only one respondent figured it out. Congratulations, Eliza. I have been wanting a baby skunks for many years now.